The entertainer. Asus claims its NV76VM is the perfect multimedia notebook, boasting enough computing and graphics power, a good screen, and practical interfaces. 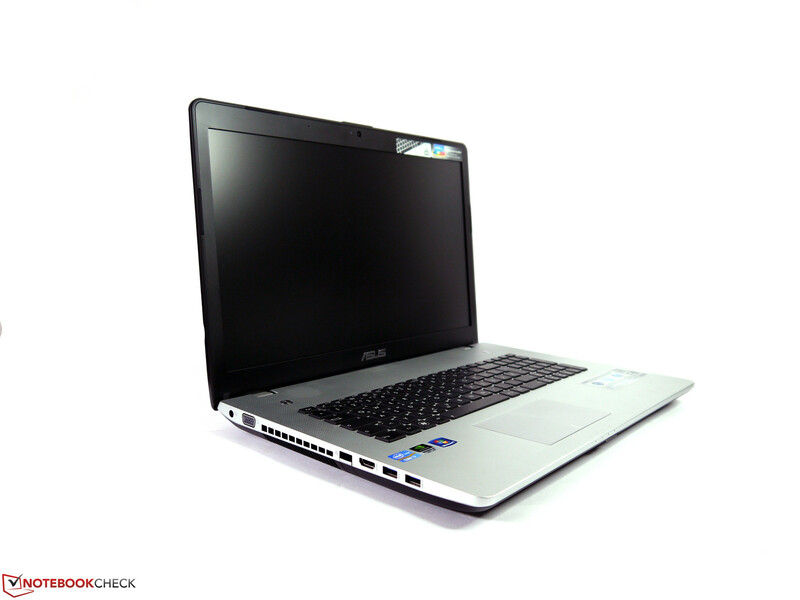 In this review, we scrutinize to what extent the Asus NV76VM lives up to these claims or possibly even surpasses them. Recent events suggest that 17-inch notebooks are becoming obsolete. Lenovo discontinued its second generation ThinkPad W701 workstation and Apple’s MacBook Pro 17 did not survive the series’ last refresh a few weeks ago. These facts make Asus’s decision to completely revamp its 17-inch N7x series even more surprising after only one year. As we reviewed both the N56VZ and N56VM 15-inch models a few days ago, we can confidently state that the Asus N76 closely resembles its smaller brethren and uses a virtually identical, albeit slightly larger, case. As with the N56 models, the N76 is available in two variants. The N76VM is equipped with the Nvidia’s GeForce GT 630M and the N76VZ features the Nvidia’s GeForce GT 650M. Both models are currently available in Germany and feature the same Intel Ivy Bridge quad-core i7-3610QM CPU as the standard processor. 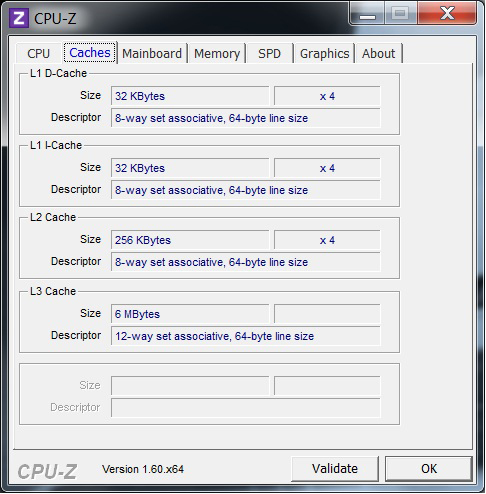 Other CPUs are optionally available. Similarly the user can select from a number of options in terms of RAM configurations, hard disk capacities, and the choice of DVD and Blu-Ray readers and writers. The user is provided with the choice of 1600x900 or 1920x1080 resolutions for the matte display. 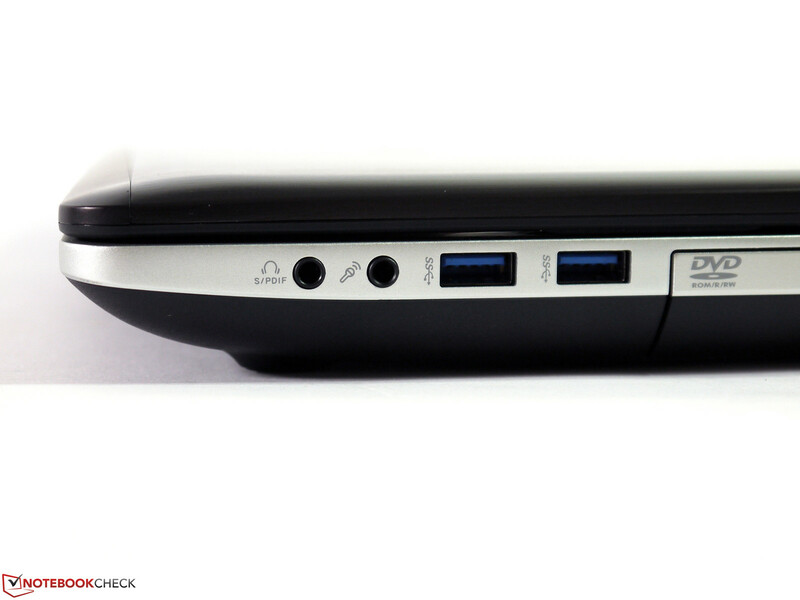 Our test device, the N76VM-V2G-T1078V, is equipped with 8 GB RAM, 2 TB hard disk capacity, and a standard DVD writer. The current street price of this model is approximately 1150 Euro ($1425 USD). For the N76 family, Asus chose to use a fundamentally different case than the previous N75 family. The high-gloss plastics of the previous generation have been replaced by a significantly higher quality blend of materials, namely aluminum and plastic. The high-gloss finish has been replaced by a brushed, black-gray aluminum finish for the display lid which provides a pleasant contrast to the aluminum colored work surface of the base unit. Austere at first glance, the overall façade disguises a premium device. 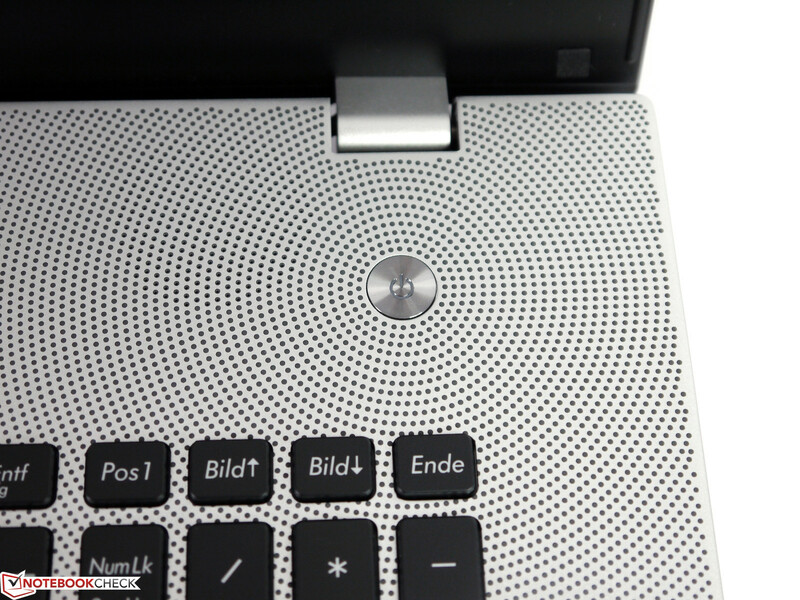 Were it not for the circular perforated and printed pattern, the base unit might cause a passerby to mistake the Asus device for an Apple notebook. 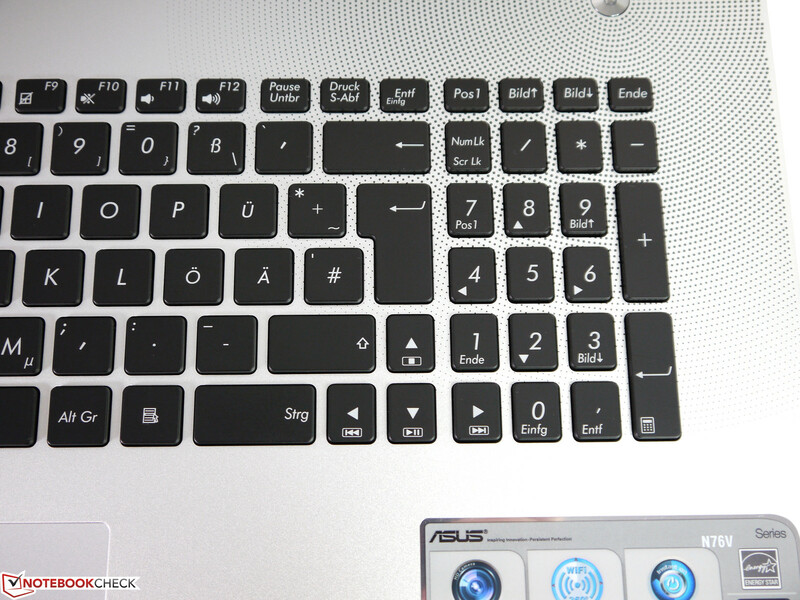 The Windows sticker on the wrist rest and Asus logo at the bottom of the display are the most obvious proof to the contrary. 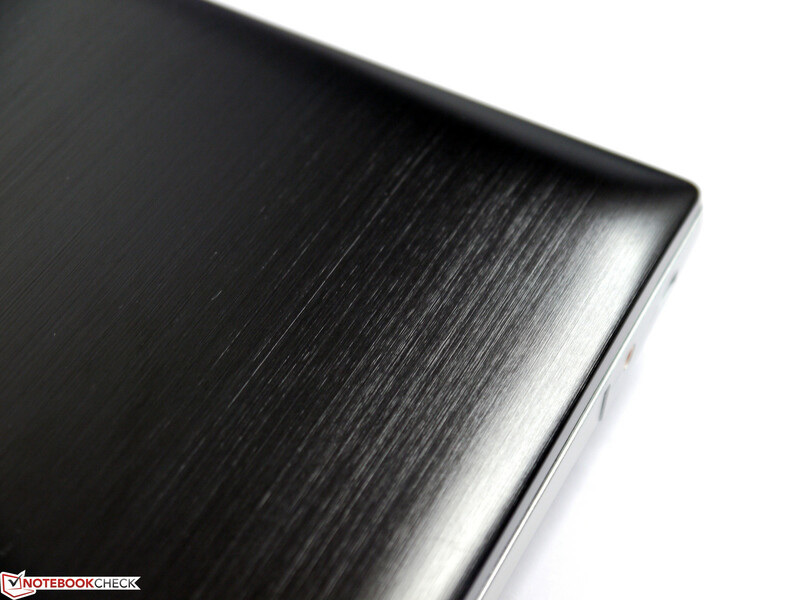 While the overall impression, material, and build quality falls short of those of the Apple unibody case, Asus has nonetheless created a very high-end product that undoubtedly belongs to the premium notebook sector. The two-tone base unit clearly reveals its two-piece construction. The top aluminum piece ends at the interfaces and is continued by the grey-black plastic bottom piece. While equally rigid and stable, the bottom piece lacks the chic appearance of the aluminum upper piece. 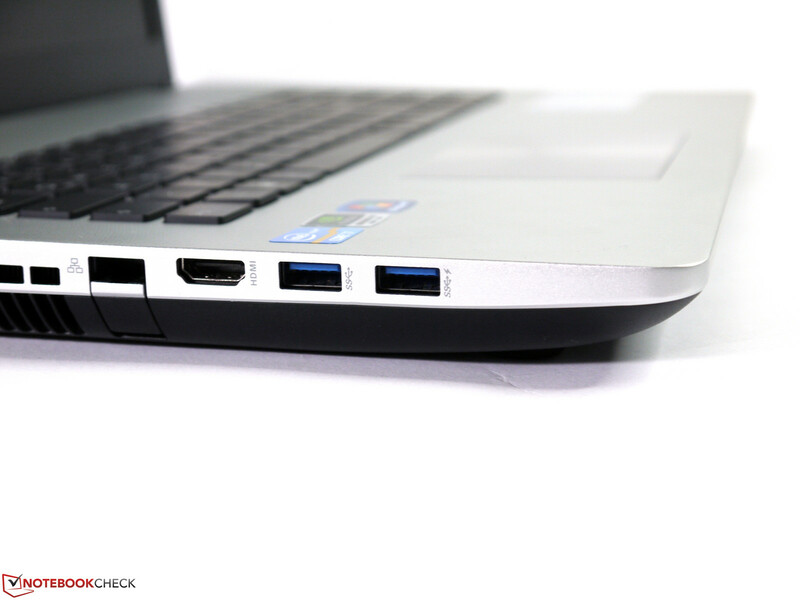 The HDMI and USB ports, in our opinion, are not sufficiently flush with the side surface and are slightly inset. Instead of being fabricated from a matching grey-black plastic, the optical drive tray is merely painted to match. We also found that the battery is not completely flush with the back edge of the base unit and creates an unnecessary protrusion. Otherwise, the torsional rigidity of both the base unit and display lid are good. 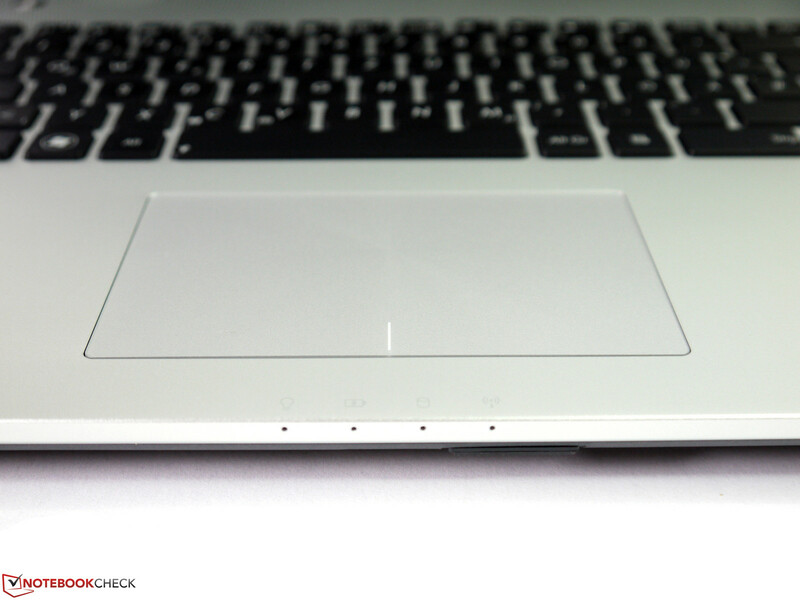 The critical areas – the wrist rest, above the optical drive, and the battery component – demonstrated either no depression or only marginal depression under specific pressure. The display hinge construction limited the opening angle slightly but demonstrated neither teetering nor any significant weakness. 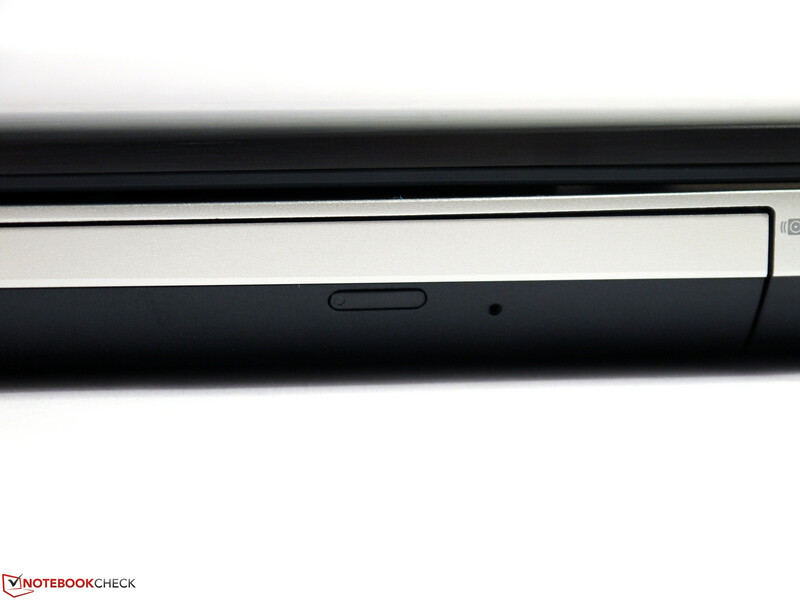 It should be mentioned that the N76VM is not as slim as Asus’s advertising photos suggest. 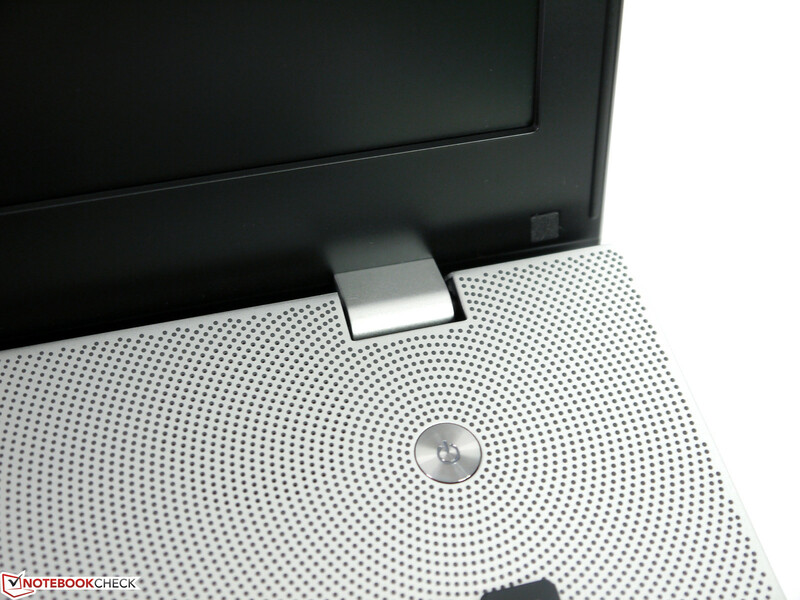 For promotional effectiveness, pictures of the 17-inch notebook only show the 14 mm (0.55 in) aluminum upper piece of the 35 mm (1.38 in) base unit. The overall dimensions of the N76VM – 415 mm (16.3 in) width x 280 mm (11.0 in) depth – and its 3.56 kg (7.83 lb) weight are typical for the 17-inch class and thus place the device in the notebook category as opposed to the king-sized ultrabook image that the advertising photography suggests. Fortunately, Asus chose size- and class-appropriate equipment for this model. Ever since Intel introduced the “Panther Point” Platform Controller Hub (PCH) in the Intel 7 Series chipset, slower USB 2.0 ports have been replaced with the USB 3.0 ports that the chipset natively offers. 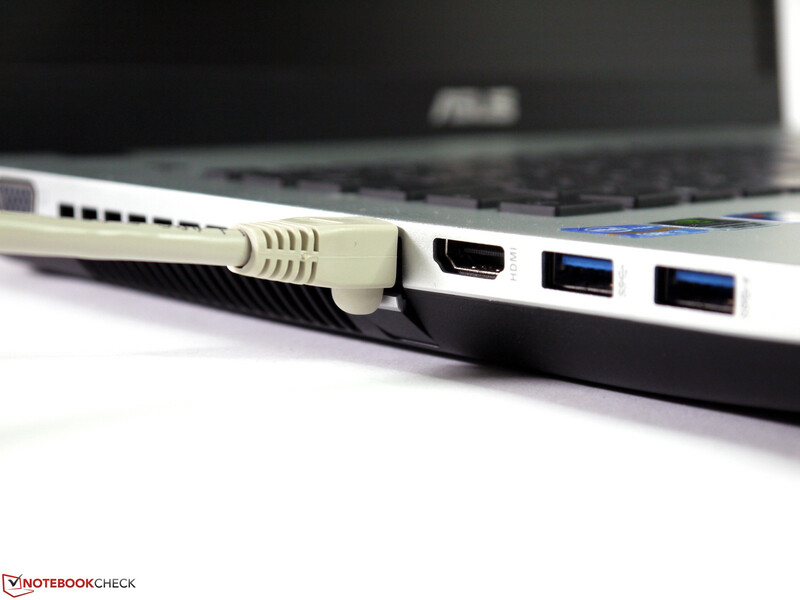 The Asus N76VM is no exception and comes with four USB 3.0 ports equally distributed over both sides of the unit. In our tests, we measured a sequential read speed of 159 MB/s and a peak 168 MB/s in real world data transfer using an Intel SSD 320 mounted in an external USB 3.0 enclosure. 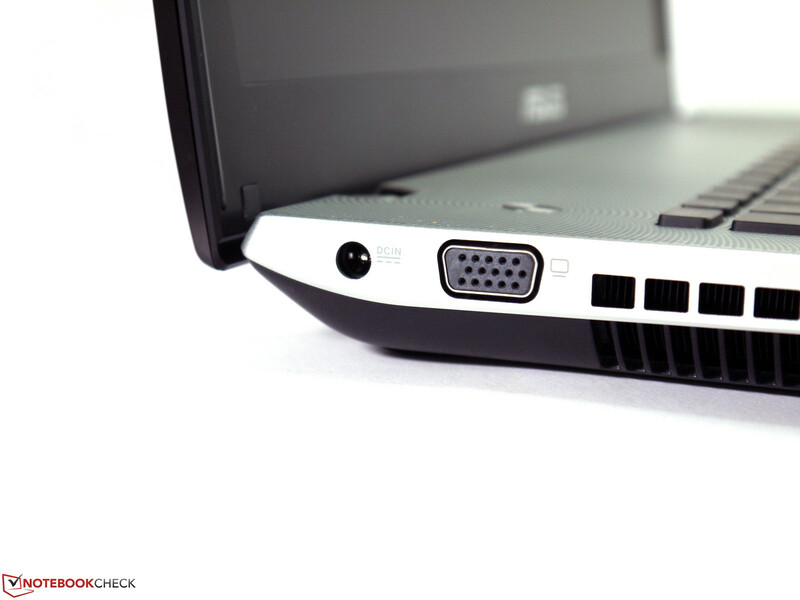 While the notebook lacks Firewire, eSATA, and ExpressCard interfaces, the device does have both an analog VGA port and a digital HDMI output with a maximum output resolution of 1920x1200 for connecting external displays and TVs to the system. A Gigabit LAN jack, two dedicated audio input/output jacks, and an additional subwoofer output round out the connectivity features. This is a very good and more-than-sufficient mix of interfaces for the target consumer group of ambitious home users. On the other hand, the frontal side interface placement gave us mixed feelings. 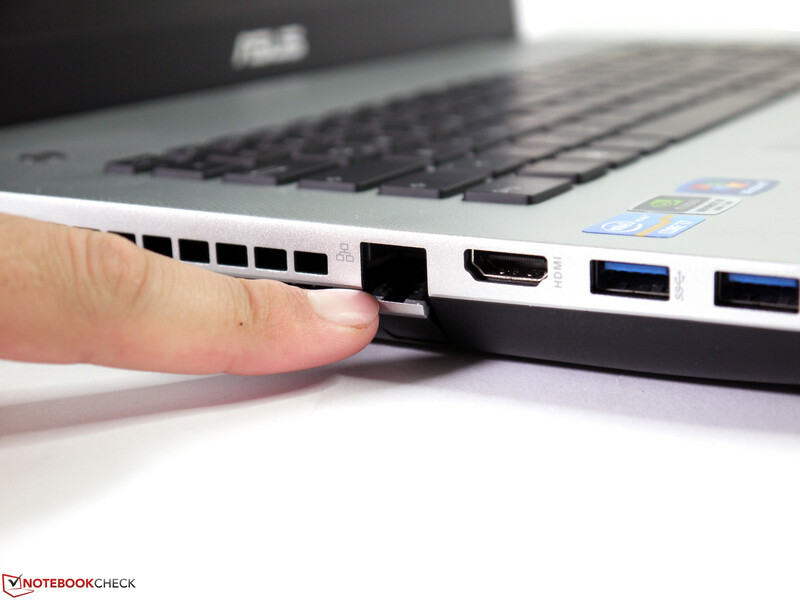 While the ports are easily within reach, they might get in the way when using external peripherals such as hard disks, displays, and a USB TV tuner. A conventional DVD writer, with additional DVD-RAM support, was installed as the optical drive in our sample unit. We found the opening mechanism to be a bit awkward as it was difficult to locate by touch and often did not respond until after being pressed several times. Alternate configurations offer a combination Blu-Ray reader and DVD writer. The abundant communication options include Gigabit LAN, 802.11b/g/n Wi-Fi, Bluetooth 4.0, and an HD webcam. Universal Mobile Telecommunications System (UMTS) was unavailable and the unit likely cannot be retrofitted to support this. A TV receiver with a connector for an external antenna was listed as an equipment option but we were unable to determine which model the receiver is, what standards are supported, and how it is integrated into the system. Moreover, none of the configurations available in Germany come with this TV tuner package. 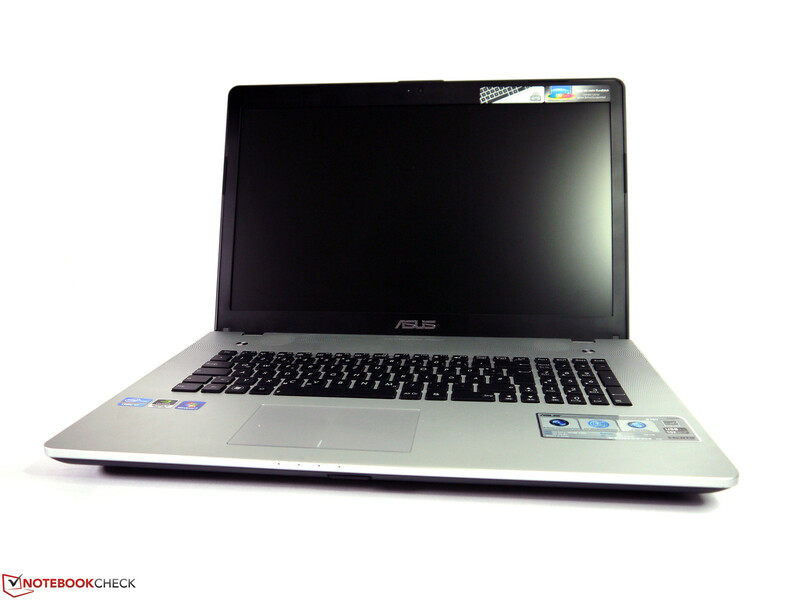 Asus has been known for installing numerous tools and trial versions of software in its notebook and the N76VM is no exception. However, we found two small gems in the heap of software that are not the typical trial versions or bloatware. 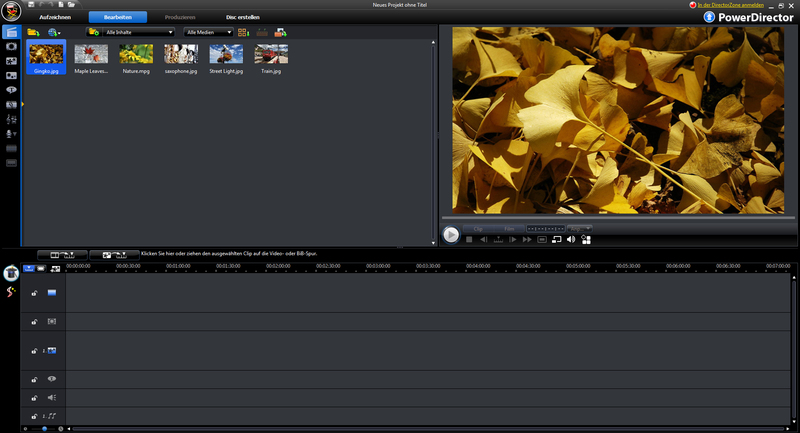 The Cyberlink MediaEspresso 6.5 media converter and Power Director 8 video-editing programs are both included as part of Asus’s Video Magic suite. Both programs are quite useful bonuses for users who frequently watch or record video. The only accessories included in the retail package are a good subwoofer, a cleaning cloth, a cable tie, and a DVD of software. Asus provided no device-specific supplies or extra battery. Should accessories be required, the user must purchase these separately from Asus or a third-party provider. 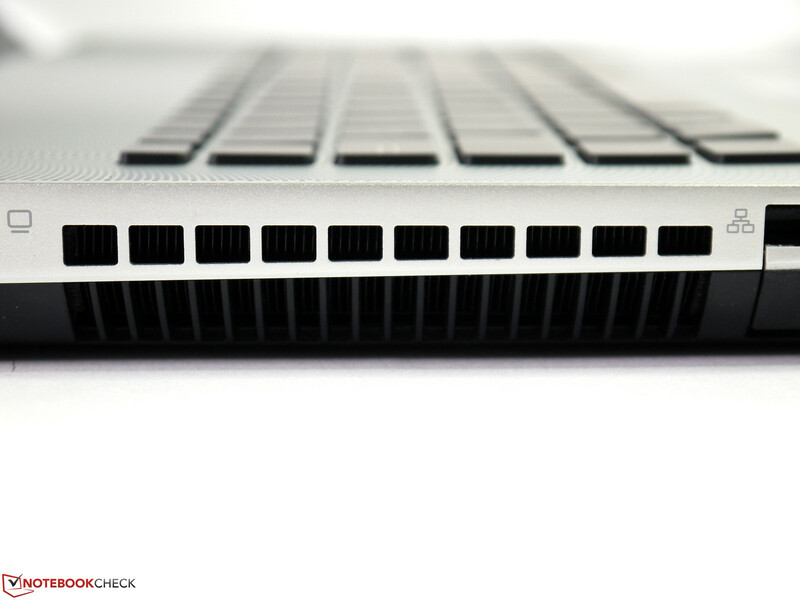 A large maintenance cover on the underside of the base unit conceals two hard disk slots and both RAM banks. Our test model came fully equipped and every slot was occupied. Our sample N76VZ, which has yet to be reviewed, came with only one built-in hard disk and the screws and hard disk cage for a second drive were included in the packaging. It would appear that Asus did not intend for the device to be opened any further and no mention regarding this could be found in the manual. Further disassembly of the notebook would require removing all screws and plastic hooks that keep the plastic and aluminum case pieces together. We skipped this step to avoid damaging our loaned test sample. Accessing the internal components and cleaning the fan are only possible if one is willing to accept the increased difficulty and higher risk of damage. 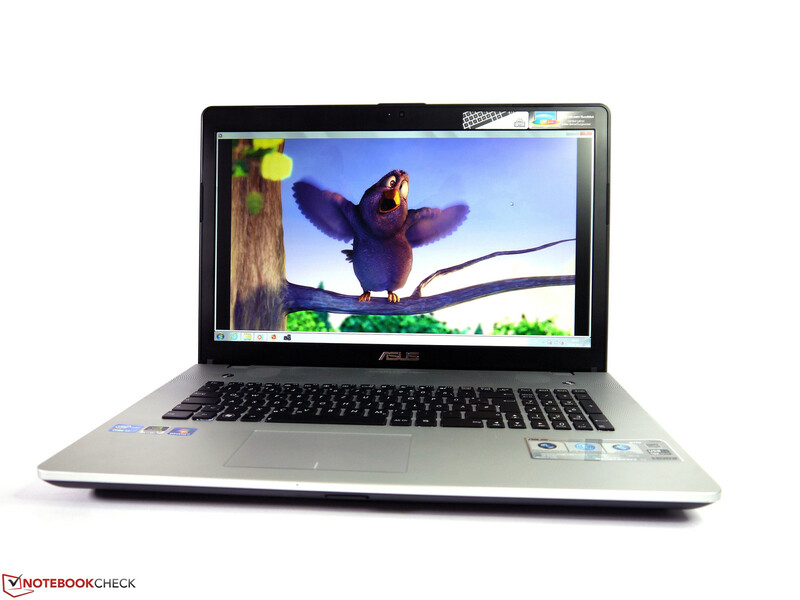 Asus provides a 24-month international warranty on the hardware. The warranty can be extended to three years within the first 12 months after purchase. We found the 69 Euro ($85 USD) and 79 Euro ($99 USD) premiums on local and international extensions from the Asus online shop to be quite reasonable and worth consideration. 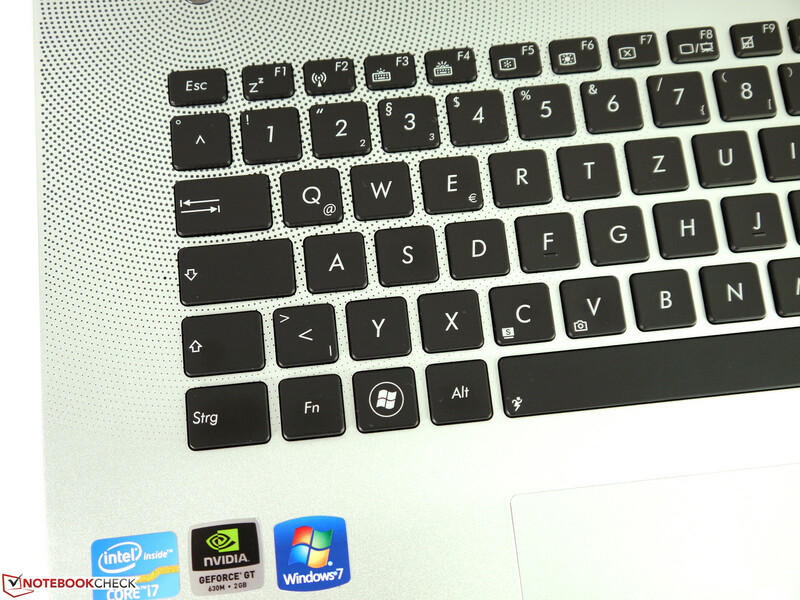 The N76VM uses a chiclet-style keyboard with standard-sized 19 mm (0.75 in) keys. The keys have a short drop, a soft stop, and a pleasantly unobtrusive typing noise. The keyboard plate fits tightly and coiling could not be determined. 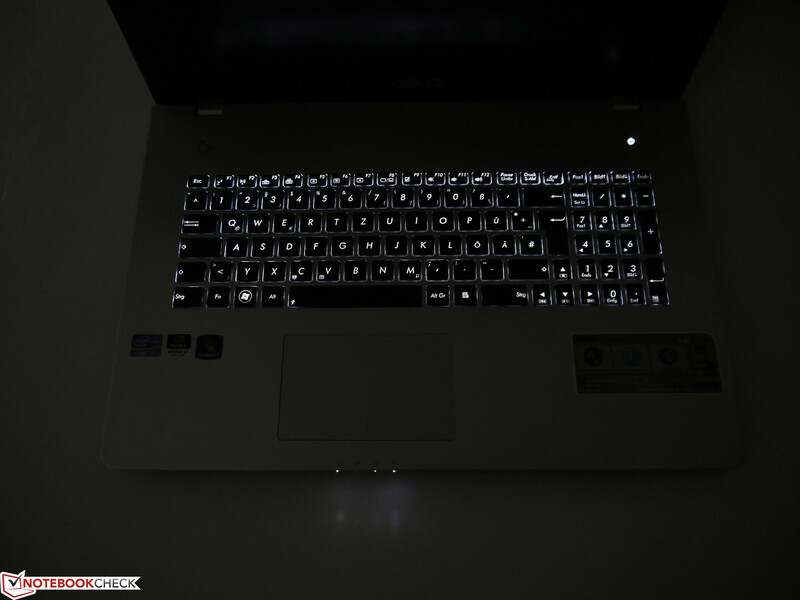 The high contrast white-on-black key lettering can be illuminated by the keyboard’s backlight to one of three intensities. The separate number pad uses narrower 13 mm (0.52 in) keys and required only a short time to get used to. The arrow keys, which we found to be too small, required a longer period of familiarization and might prove annoying in the long run. This smaller arrow key size has a more profound impact than usual in games. 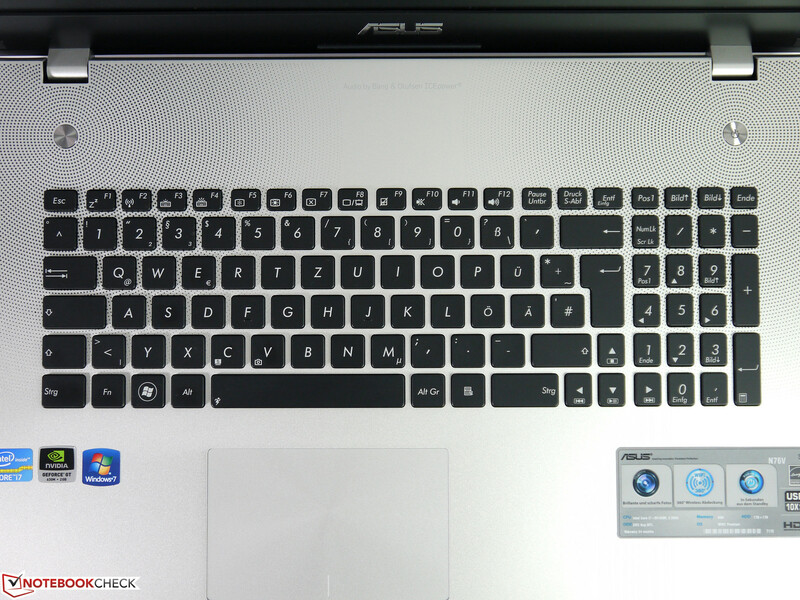 In both test samples from the N76 family, we noticed the Fn key marginally juts out of the keyboard. This was only noticeable when observing the keyboard horizontally with the backlight activated. This did not have a negative effect in our tests. While we were pleased with the keyboard, the touchpad proved to be less pleasing despite its size. 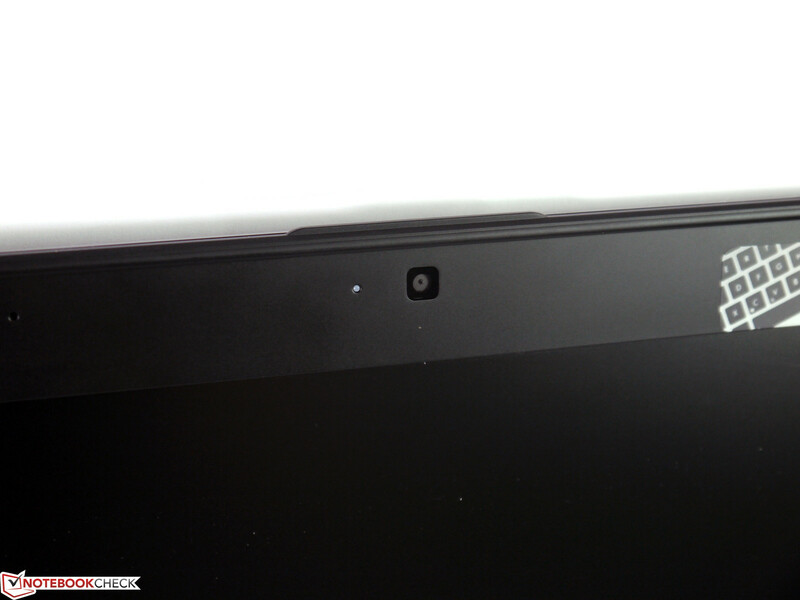 The touchpad on the N76VM uses incorporated mouse buttons and pressing on the entire touchpad should trigger a click. We found that this unfortunately did not work as well as it should have. The mechanism was quite stiff and varied in response depending on whether the press was toward the sides of the touchpad surface. Reliable input was only accomplished in the center of the left and right tap areas and we found these areas would clatter during our tapping. Although not as distinctive as in the ThinkPad Edge E530 , it was nonetheless unpleasant and particularly so when trying multi-finger tapping. 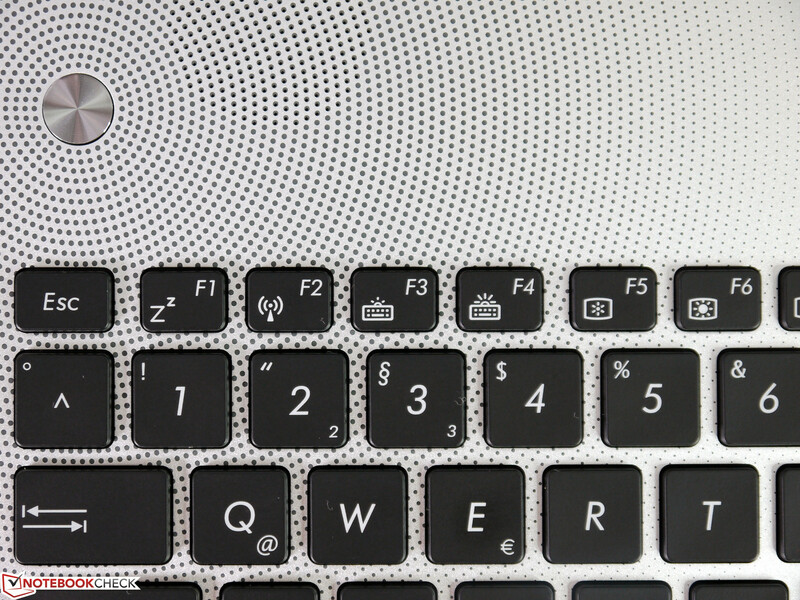 The touchpad can be easily and quickly disabled by using the Fn-F9 key combination for those who prefer an external mouse. The N76 family allows the end-user to choose one of two different LED-backlit screens. The first option supports a 1600x900 (HD+) resolution. All models currently available in Germany use the second option, a 1920x1080 Full HD screen and we were unable to find a version with the HD+ screen. This is not an issue as the matte Full HD screen matches the N76 perfectly in terms of purpose. Both of our N76 test devices – the N76VM under review and the N76VZ – use identical Chi Mei Optoelectronics (CMO) displays. 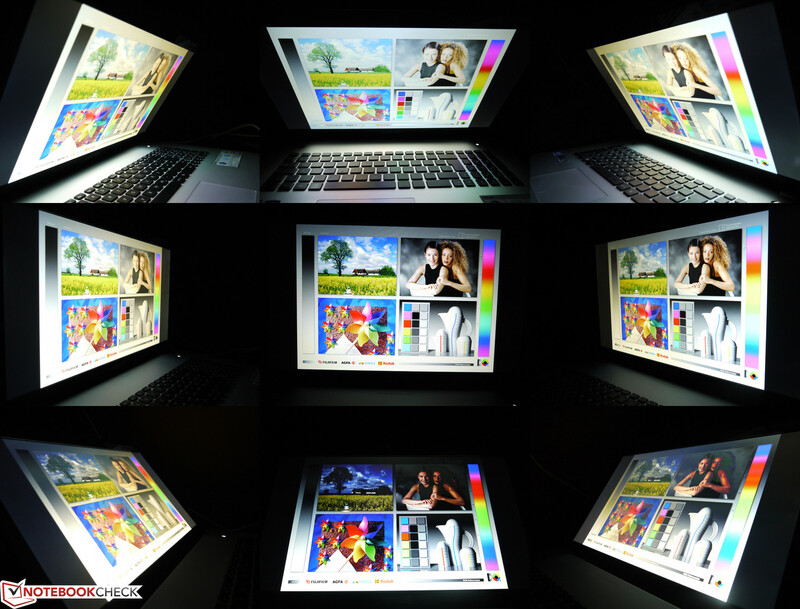 In our test, we measured the brightness in 9 regions of the display and found a brightness range of 213 to 258 cd/m2. These results provide an average brightness of 233 cd/m2 and an acceptable illumination of 82 percent. Subjectively, we only observed brightness differences in monochromic backgrounds and we were left with a homogenous impression. Very narrow light areas are visible only on the screen’s edges and these areas would be significantly larger in comparable models, even those with smaller screens. The brightness can be adjusted to one of ten levels. Level 8 corresponds to approximately 150 cd/m2 which is typically sufficient brightness for indoor use. On the other hand, the display’s maximum brightness may prove insufficient for outdoor use. The maximum available brightness on battery power is sufficient when a proper, shady environment is chosen. The display’s matte surface prevents reflections from marring the screen and the high contrast ratio of 821:1 contributes to the visibility of the display’s contents. Exceptionally bright, sunny days and direct sunlight should be avoided. We found the aforementioned contrast ratio to be pleasing and this ratio distinguishes the display from the mass of contrast-weak screens. Pictures, movies and games are beautifully rendered in crisp colors and dark black. 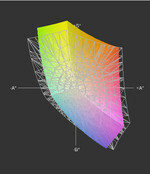 This impression is supported by the screen's fairly large color spectrum. 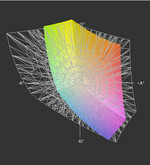 The sum of all reproducible colors was over 763000. Arithmetically speaking, this sum represents 91% of the sRGB palette. As the screen displays a bit more in the yellow-green range than is necessary, the sum reflects an inflated value. This result will not be a disadvantage for normal users and amateur photographers will find this display more than sufficient. Nonetheless, the display will not satisfy graphics professionals and they will need to rely on external monitors or expensive professional notebooks with RGB LED screens. Asus touts particularly high viewing angles and proudly placed a stick indicating this on the display bezel. We found this claim to be accurate and overall viewing angle stability to be good. While the display falls short of the quality of IPS displays, deviations in brightness, contrast, and color appear at greater angles than in many other notebook displays. Color inversion and fading beyond recognition did not occur. 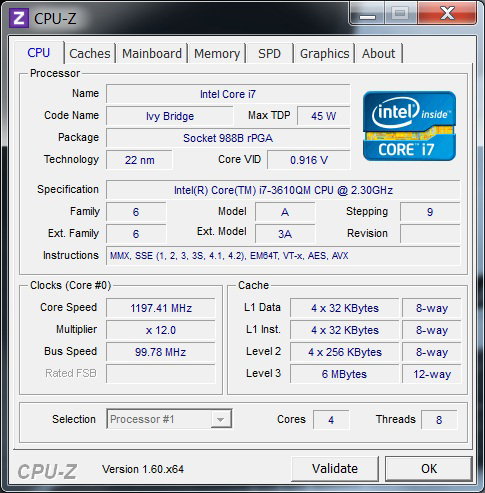 The N76VM uses the HM76 chipset from the latest Intel 7 Series family. 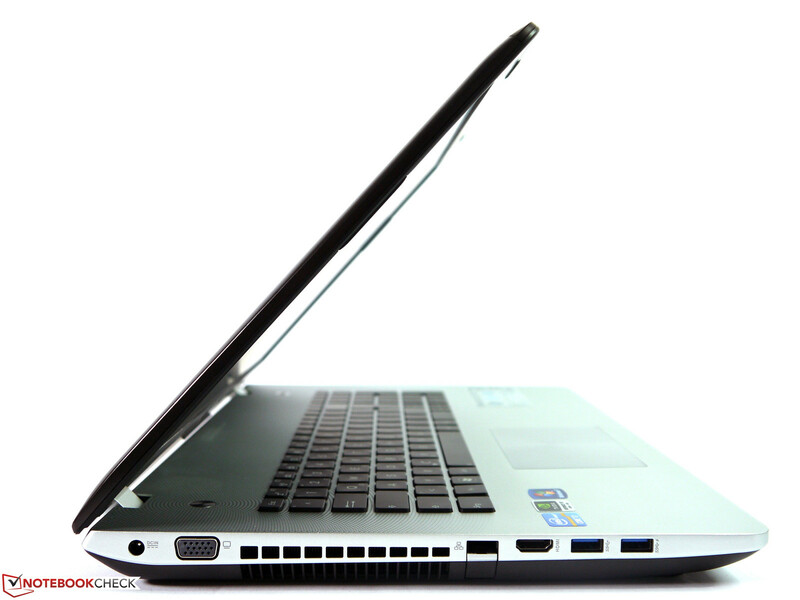 This platform serves as the basis for the mobile performance sector of notebooks and features native USB 3.0 support. PCI Express 3.0 and DDR3/DDR3L-1600 support are also interesting improvements. The brand new Intel Ivy Bridge quad-core i7-3610QM CPU has a 45 Watt TDP and ensures that the notebook has sufficient processing power due to the combination of Intel’s Hyper Threading and Turbo Boost 2.0 technologies and 6 MB of L3 cache. As of this review, the processor is one of our top 10 of mobile processors. While potent dual-core processors such as the Intel Core i7-3520M can achieve high scores in single-core benchmarks due to their higher clock speeds, this quad-core CPU clearly demonstrates its strength in multi-core optimized applications. The graphics subsystem is powered by the Nvidia Optimus combination of integrated Intel HD Graphics 4000 and dedicated Nvidia GeForce GT 630M. The system is supported by 8 GB DDR3-1600 in two 4 GB modules. 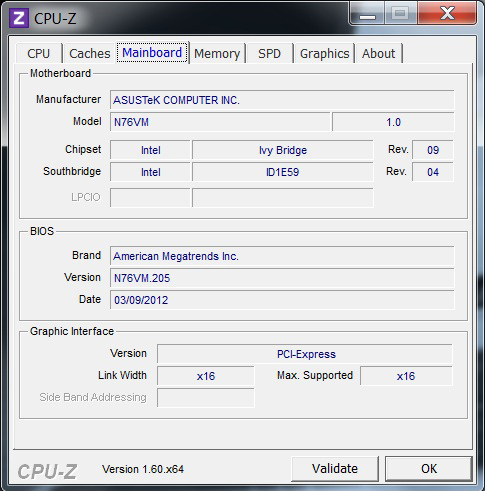 Asus claims this is the system limit but the chipset and CPU should be capable of supporting 16 GB. We were unable to test this theory due to our lack of 8 GB RAM modules during testing. 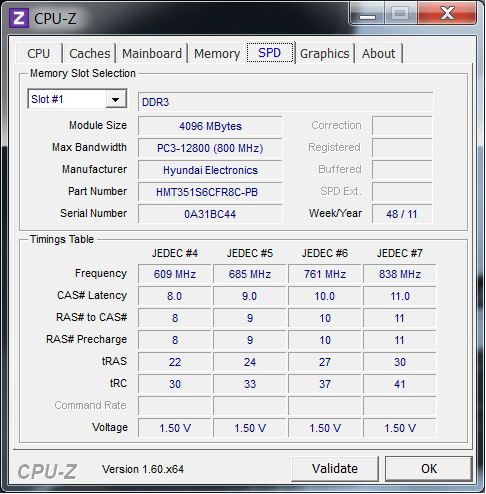 The Ivy Bridge quad-core i7-3610QM CPU has been thoroughly tested in other reviews. While on AC power, we observed benchmark scores of 5566 and 21323 for the Cinebench R10 64-bit Single CPU and Cinebench R10 64-bit Multiple CPU tests respectively. On battery power, we observed scores of 5558 and 21385 for these tests, indicating that there is no automatic throttling of the 45 Watt CPU as might be the case in other notebooks. Using Furmark and Prime95, we performed a stress test to determine the CPU’s stability in the high-performance profile. The system ran stably for 10 minutes at 3 GHz before the system clock began fluctuating between 1 and 3 GHz for approximately 1 minute. During this test, HW64 monitored a temperature of between 94oC and 96oC (201oF and 205oF) for the four cores. After this short fluctuation, the processor recovered and continued running consistently at nearly 3 GHz accompanied by a slightly increased fan speed and the core temperatures dropped to between 90oC and 94oC (194oF to 201oF). We did not observe any further clock fluctuations during our approximately one-hour test. Immediately after our stress test, we conducted a Cinebench R10 64-bit benchmark and measured 5470 points and 21492 points in single- and multi-CPU tests respectively, demonstrating no significant performance loss. These benchmarks allow us to conclude that throttling will be very slight, if at all, only in extreme situations and non-existent in practical use. The Asus N76VM is more than sufficiently equipped for virtually all conceivable office and home user needs in terms of performance. Image processing, managing databases, and video editing are trivial for the system. Performance-demanding tasks such as video conversion can be accomplished quickly using Nvidia CUDA and Intel Quick Sync technologies, or the quad-core CPU by itself. Both graphical solutions placed a fairly low load on the CPU, in the range of 3 to 55 percent depending on the format while pure CPU conversion heavily loaded (95 percent) the CPU and the system became more or less unusable for other tasks. In our tests, the Intel Quick Sync technology proved to be superior and can result in differences of several minutes or even hours for larger projects. The i7-3610QM CPU was capable of converting MP3 files to AAC format using iTunes at a 48.1x speed. Our practical impressions are supported by PCMark Vantage and PCMark 7 benchmark tests. The N76VM scored 8584 and 2469 points respectively. These scores are very good and can only be surpassed by systems using a solid state drive. The hard disk assessment was fairly low compared to overall performance and the 3583 points scored in the PCMark 7 Storage Test proves that the system bottleneck is the storage device. 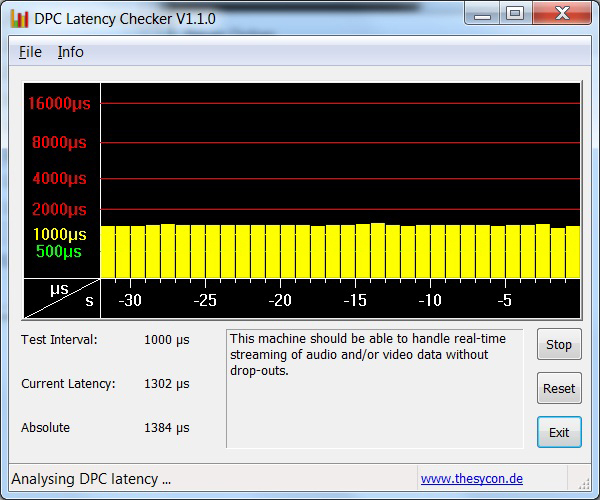 Using DPC Latency Checker, we checked for potential performance latencies that might occur while using external peripherals. The N76VM achieved latencies of approximately 1300 µs which is clearly below the critical limit of 2000 µs. As a result, latency issues should be non-existent in this notebook. As previously mentioned, our sample N76VM features two 1 TB Seagate Momentus SpinPoint drives. These drives, formerly designed and manufactured by Samsung, now carry the Seagate brand due to Seagate’s purchase of Samsung’s storage division during the last 8 months of 2011. Both 2.5-inch hard disks have a build height of 9 mm (0.35 in), 5400 RPM rotational speed, 8 MB cache, and a peak read speed of 112.6 MB/s. HDTune recorded an average transfer rate of nearly 90 MB/s and demonstrates the drives are on par with the current performance level of conventional hard disks. We found that the BIOS does not allow for the configuration of a hardware RAID to stripe (RAID 0) or mirror (RAID 1) data. The factory default partitioning of the available 2 TB is a matter of personal preference. Asus ships the N76VM with an operating system partition, three additional 500 GB partitions, and an “invisible” recovery partition. Many users may choose to change this partitioning. As mentioned in the System Performance subsection, the storage solution is clearly the system’s bottleneck. A solid state drive could achieve a subjectively noticeable performance boost. We will be able to quantify this performance boost using the Samsung SSD 830 in the upcoming review of the N76VZ model from the same family. The N76VM is equipped with two graphics systems controlled by Nvidia Optimus technology. Optimus should always ensure the perfect solution for every situation and will switch between the graphics card automatically. 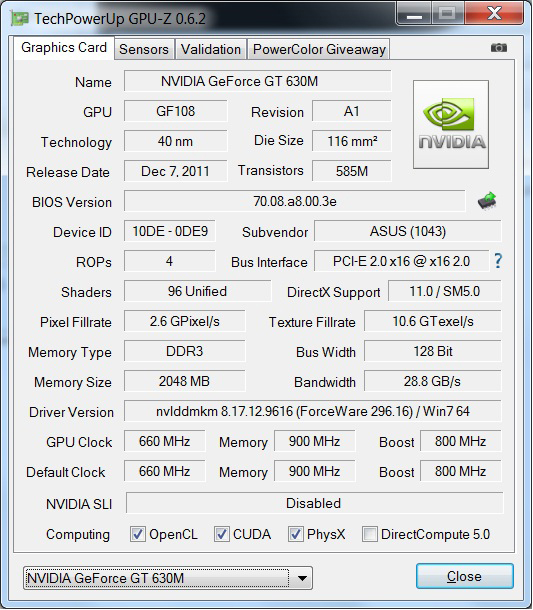 Should the user desire to use a specific graphics card for a particular application, this can be assigned using the associated software. At this point, Optimus is sufficiently sophisticated and the user is generally unaware of it operating in the background. The CPU-integrated Intel HD Graphics 4000 typically handles basic tasks and the nominally more powerful Nvidia GeForce GT 630M is used in the case of more demanding 3D applications such as games and graphics rendering. Our first test, however, showed the Nvidia GPU’s limits. In the Cinebench R10 64-bit OpenGL test, the Intel GPU scored 6906 points, an increase of 51 percent over the GT 630M which scored 4581. This is clearly a surprising result and prompted us to perform more tests. 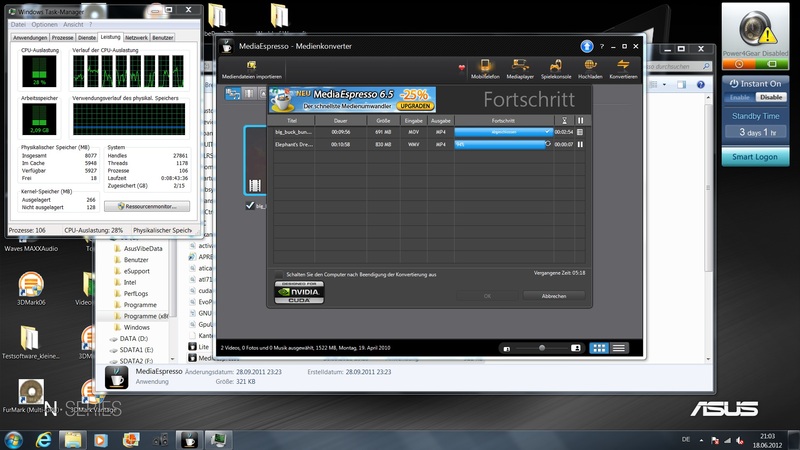 In the Cinebench R11.5 64-bit OpenGL test, the GT 630M took the lead with 29.06 points to the HD 4000’s 20.08 points. The result in 3DMark Vantage was similar with scores of 5541 and 4008 points for the GT 630M and HD 4000 respectively. This superiority was also demonstrated in Unigine Heaven 2.1 where the GT 630M achieved 16.4 fps and the HD 4000 maintained 11.6 fps. During our stress test scenario using both Furmark and Prime95, GPU-Z and HW64 indicated that the GT 630M reduced its core clock to 398 MHz, sometimes dropping to an even lower 324 MHz. 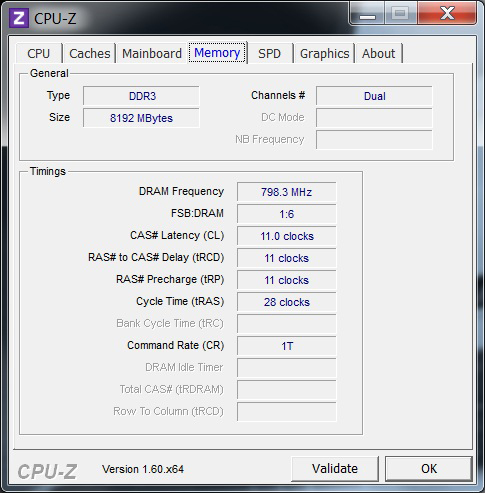 The graphics memory clock remained at 896 MHz. This demonstrates that the GT 630M is throttled during simultaneous CPU and GPU load as is the case for the ThinkPad Edge E530. Immediately after concluding the stress test, we performed a Cinebench R10 64-bit OpenGL test again and observed a score of 4583 points, showing that the nominal clock speed is restored once heavy CPU load ends. 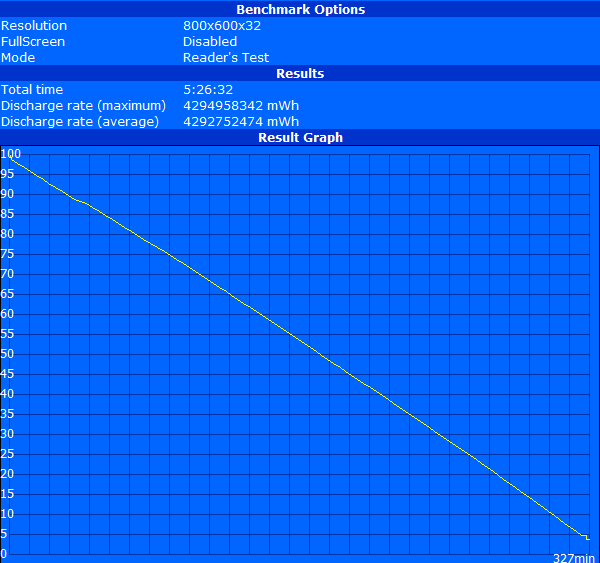 While operating solely on battery power, notebooks typically suffer from reduced GPU performance. In our N76VM, we observed no CPU throttling on battery power but GPU performance in the Cinebench R10 64-bit OpenGL test dropped by about one-third to 3372 points. 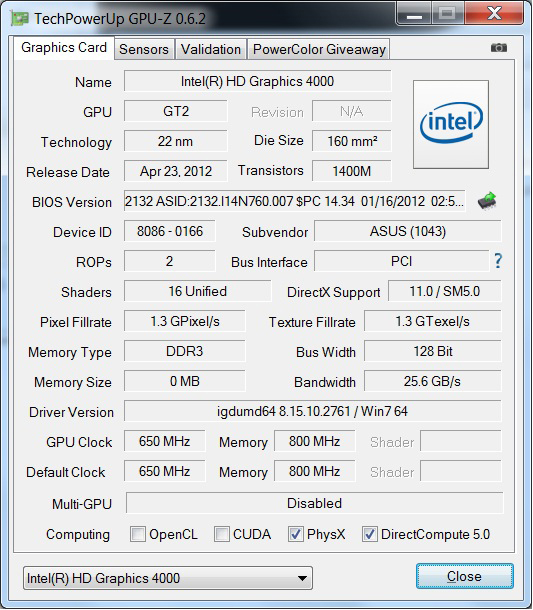 This also applied to the Intel HD Graphics 4000 which only beat this result by 100 points. It should be noted that both of our N76 test samples came pre-installed with the 8.15.10.2653 Intel driver. In both cases, we were able to open the driver settings but the tool crashed abruptly after that. We replaced the preinstalled driver with the current 8.15.10.276 driver and used that for performing our Intel tests. For high performance 3D graphics and gaming, the N76VM features a dedicated Nvidia GeForce GT 630M. This dedicated graphics solution should provide a significant performance increased compared to the integrated Intel HD Graphics 4000. To quantify this increase, we tested two games – Anno 2070 and Diablo III. In our tests, we observed a performance decrease of 30 to 40 percent when using the integrated Intel GPU as opposed to the Nvidia GeForce. The Intel solution provided 55 fps in low settings and a mere 23 fps in media settings in Anno 2070. Similarly, Diablo III was not fully enjoyable due to the 64 fps in low settings, 38 fps in medium settings, 33 fps in high settings, and 21 fps in ultra settings. 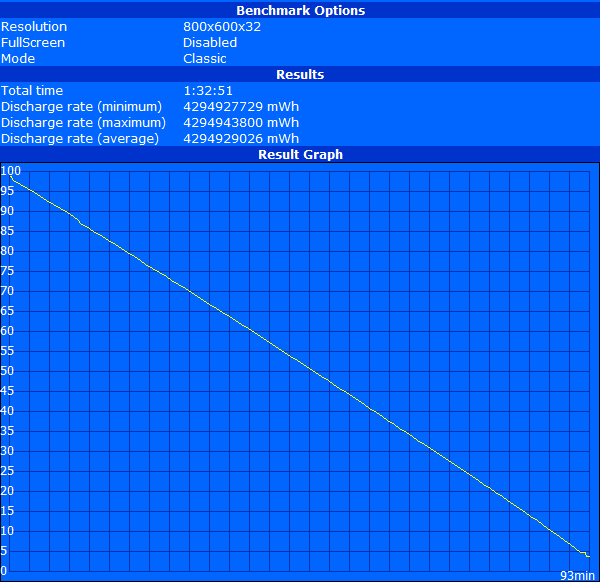 The GeForce GT 630M on the other hand was capable of medium and, in some cases, even high settings. The Nvidia card did not stutter until faced with some of the more currently demanding games. More information can be found in our extensive notebook gaming performance comparison. We observed a minimum noise level of 31.9 db(A) and a maximum noise level of 36.1 dB(A). The bulk of this noise was caused by the relatively noisy hard disks during load. The storage devices sounded surprisingly like a fan. In fact, we were unable to determine when the internal fan was active as it was drowned out by the hard disks. By comparison, the Toshiba MK3265GSX disk is a lot quieter at approximately 30.2 dB(A), partly due to its smaller capacity and slower data transfer rate. 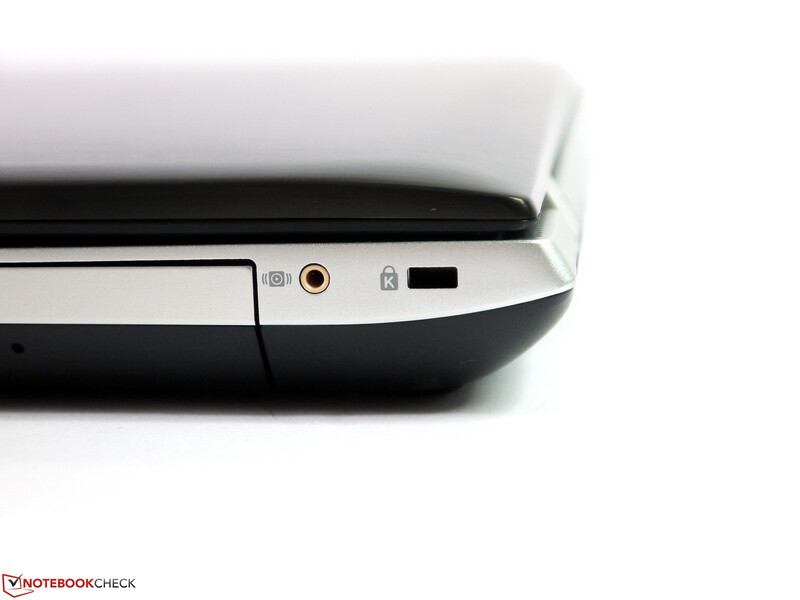 When using solid state drives as the storage solution, as in the case of our N76VZ, the notebook became much quieter. During light loads, the notebook was virtually silent with no fan operation. Even when the fan was active, it was a barely audible 30.6 dB(A). Under load situations, such as during gaming or converting videos, the fan speed increased audibly but remained at a non-obtrusive level with a maximum of 36.0 db(A). Under medium system load, the observed noise was in the range of 34 dB(A). We found the Matshita DVD drive noise to be less agreeable at 36.1 dB(A). At times, this noise level was enough to drown out dialog while watching a DVD movie on the notebook. The case’s relatively large size, large vent, and steady, moderate speed fan keep the powerful components under control. With a maximum observed temperature of 47.7oC, the case heated up noticeably under full load but this was not considered an issue as the device is intended for desktop use. However, using the notebook under these conditions on one’s lap could be unpleasant. We believe that such a scenario – full load use on one’s lap – is unlikely. Asus’s Power4Gear software tool and the BIOS do not have any options for adjusting fan behavior. We found the surface temperatures to be cool, reaching a maximum of 30oC during more relaxed, continuous use such as surfing, writing emails, and watching videos. Under these conditions, using the notebook on the lap is not a problem. We were awed by the speakers and their solid, balanced sound even without the use of the dedicated subwoofer port. Midrange pitches and bass tones were clearly rendered and the sound system does credit to Bang & Olufsen, the company that produced the speakers. The volume can be set to one of 16 levels and the sound remained undistorted at the good, maximum volume. 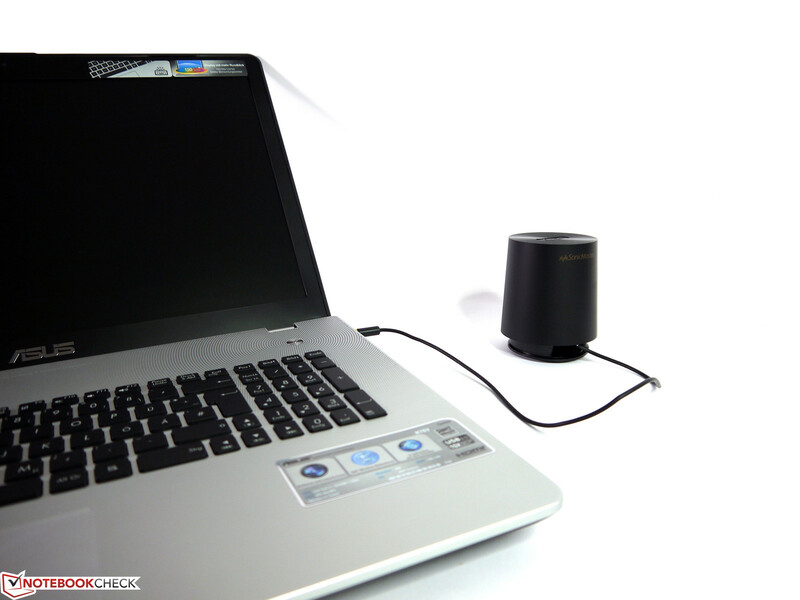 After connecting the external subwoofer, the 2.1 sound system produced an audibly excellent experience and surpassed the audio of most notebook sound solutions that we have tested. Users can forego using additional USB speakers during home use. For powering an external audio source, one can use the audio jack which supports S/PDIF. Our N76VM test sample came with a 56 Wh battery. 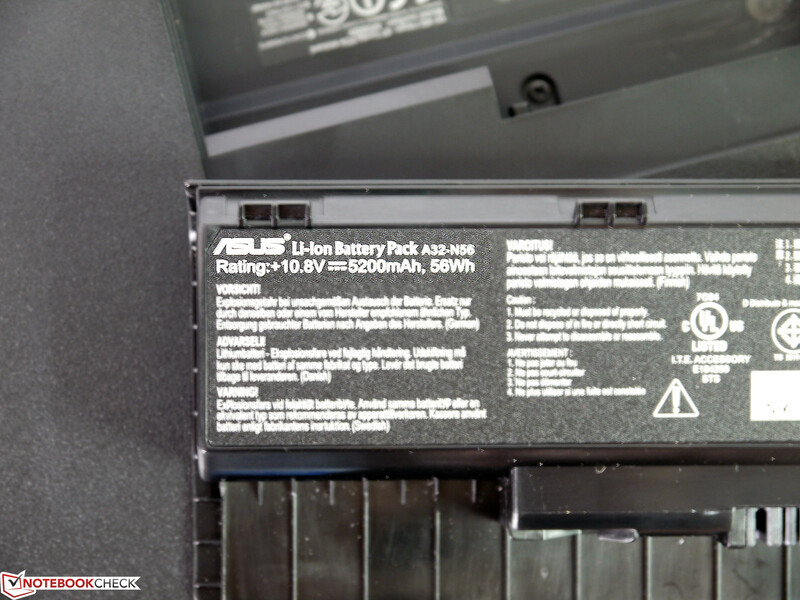 At this time, Asus offers no alternate battery. Nonetheless, this battery solution should suffice for practical tasks and the runtime should be reasonable for such a large notebook. Under minimum consumption settings – energy saving profile, minimum brightness, Intel HD Graphics 4000, idle load – we measured a consumption of 14.8 Watts at the power outlet. In the worst case scenario – all hardware in use, maximum brightness, Furmark and Prime95 running at the same time – the consumption jumped to the maximum of 82.8 Watts. 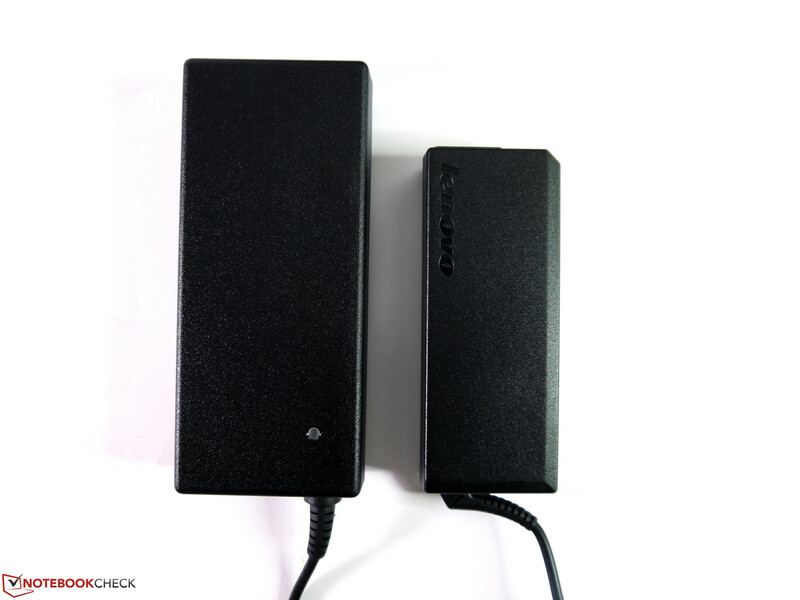 The included power supply proved more than sufficient with its maximum 120 Watt rating. 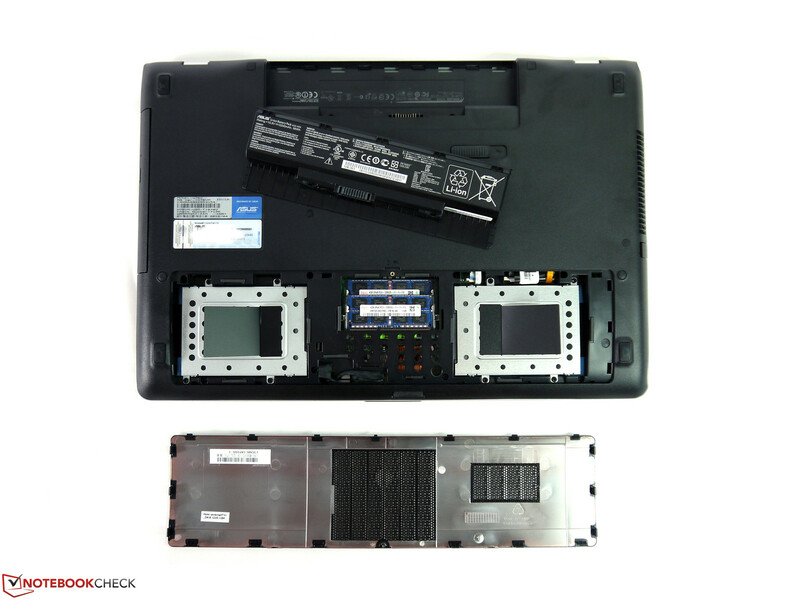 Although one might assume that a long battery runtime is out of the question for this notebook due to its power hungry components and low-capacity battery, our results proved to be surprising. Using BatteryEater’s Reader test with minimum brightness, idle load, and energy saving mode, we observed a very decent 327 minutes of battery runtime. While surfing via Wi-Fi, with brightness set to approximately 150 cd/m2 (level 8), energy savings mode activated, and Intel HD Graphics, we observed a still-good 214 minutes of battery life. While watching a DVD at maximum brightness, energy savings mode, and Wi-Fi turned off, the battery lasted 3 hours and thus even extended cut movies should not provide a problem. In the Classic test, using the high-performance profile, all consumption maximized, and maximum brightness, the system benefited from the GPU throttling previously mentioned (as in the case of the the ThinkPad Edge E530) and lasted a good 93 minutes, albeit with limited graphics power. 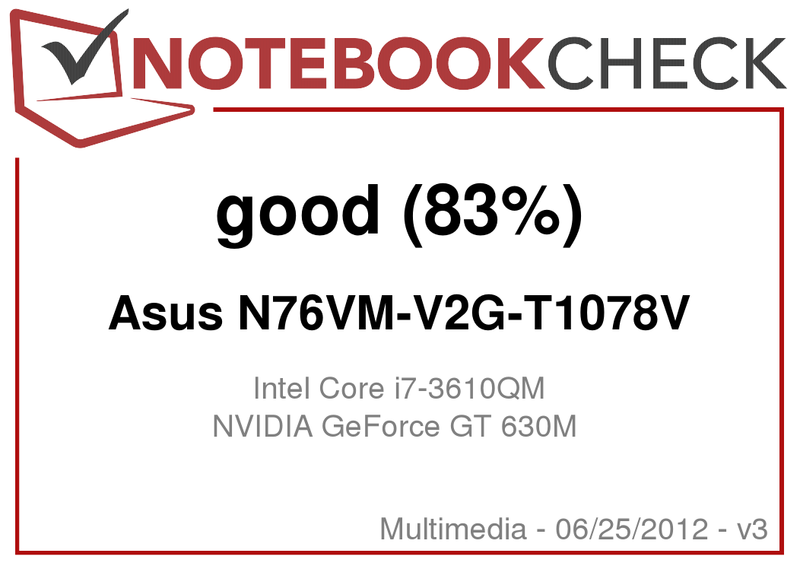 Overall, we consider the Asus N76VM to be a very well-designed notebook that does not exhibit any real weaknesses aside from the weak touchpad and limited graphics performance on battery power. The case is very good, the design is appealing, and the choice of equipment is appropriate for the target consumer group. The quad-core Ivy Bridge CPU easily handles practical applications and is supported by the Nvidia graphics solution, allowing the core components to excel. Gaming power was sufficient in our gaming tests on medium and high settings and should prove appropriate for casual gamers. The exceptionally large 2 TB storage capacity is virtually the limit of what is achievable in notebooks. It is, however, the weakest link in an otherwise strong system. The notebook falls to achieve its potential of being a very quiet notebook under light load due to the two fairly noisy hard disks. Nonetheless, the fan is never disturbing or intrusive even at full load. The sporadically loud DVD drive that springs to life during movie playback is quite possibly the worst in this regard. As a multimedia notebook, we observed no weaknesses in the key interfaces for this device category. Both the screen and sound system ensure a great all-around experience and are amongst the best one might currently find in a notebook. The advantages of this well-equipped 17-inch notebook also inevitably lead to an adverse mobility rating. Size and weight are somewhat limiting and potentially prohibitive toward use while commuting. The power supply is large and heavy and is better left at home. Doing so of course limits the notebook to no more than 3.5 hours of runtime which is good for devices of this category but may still come up short, depending on each user’s personal level of use. The Bottom Line. 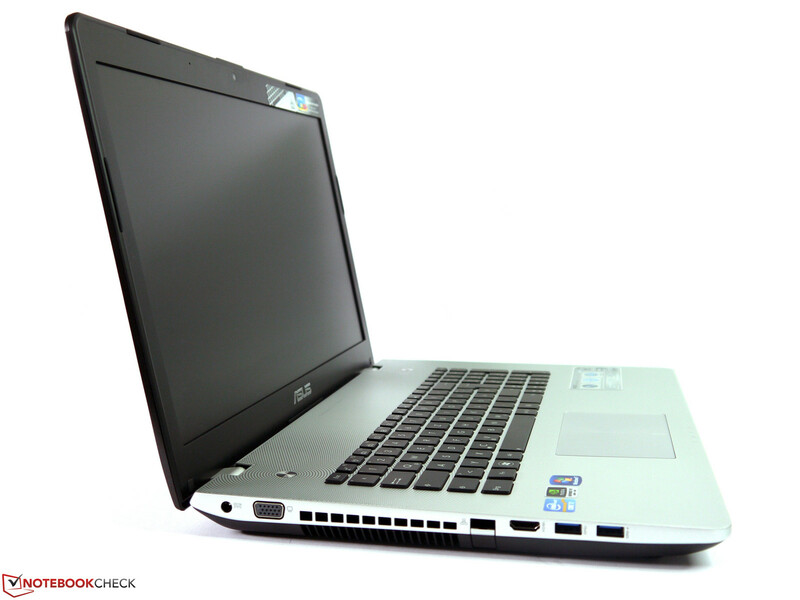 The Asus N76VM should be on the short list for anyone looking for a powerful, well-equipped 17-inch multimedia notebook. 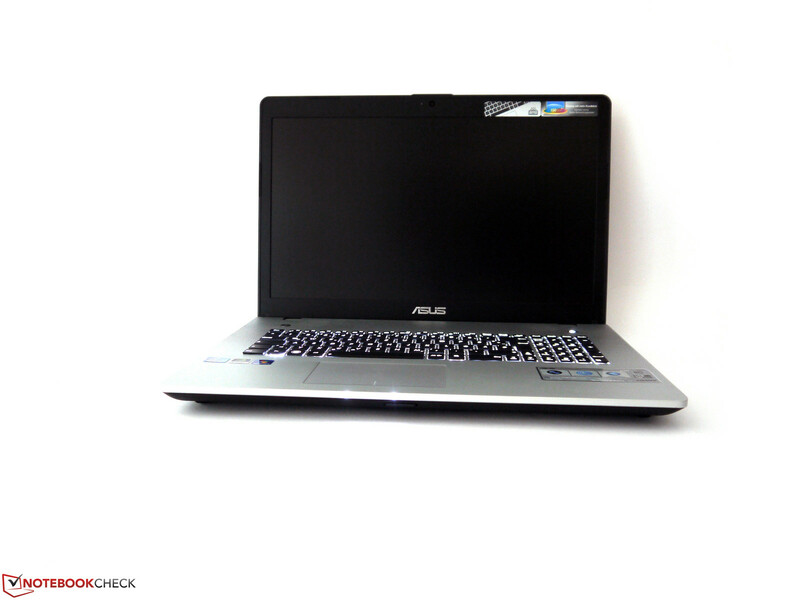 The Asus N76NV is a good multimedia notebook that is more at home on the desk than on the lap. The subwoofer has a dedicated port on the rear side area. The drive tray is made of plastic and has an awkward eject button. The subtle status LEDs on the front assist orientation when a memory card is inserted. A large cover and the battery are easily accessed from the underside. The battery only offers a mediocre capacity of 56 Wh. There are no alternatives. 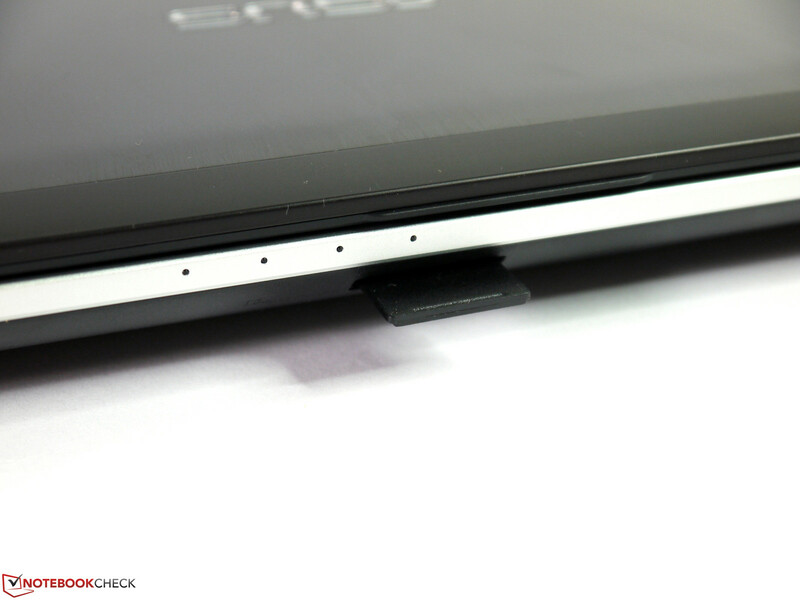 Two drive slots for 2.5-inch hard disks allow a very large storage capacity in our test device. 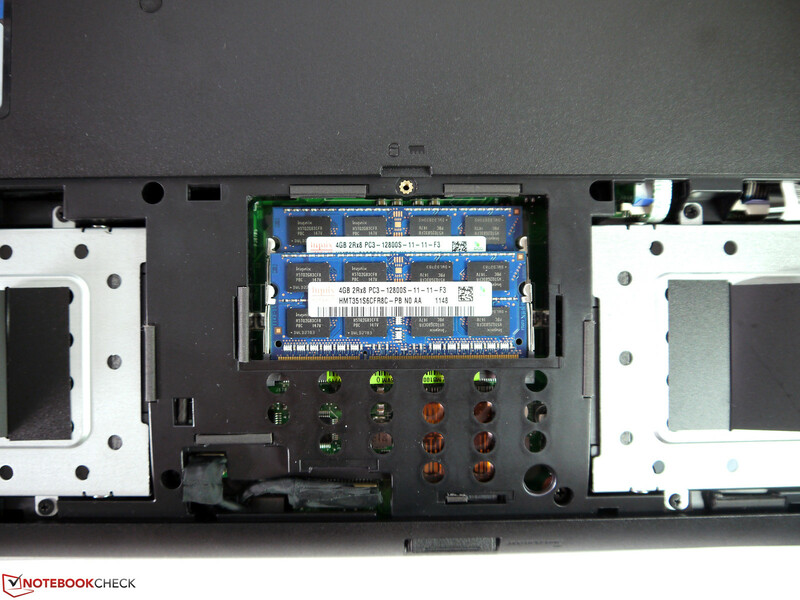 A combination including an SSD is possible by retrofitting. 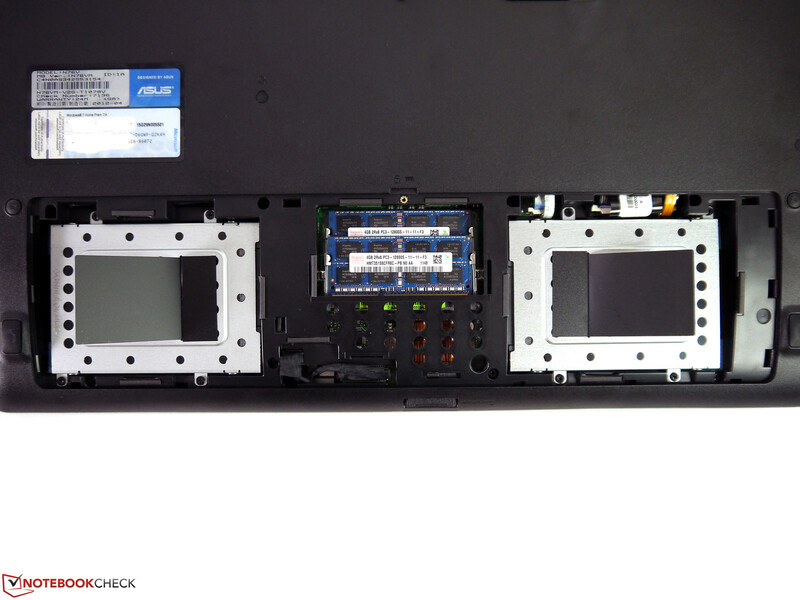 According to Asus, the maximum capacity is reached with 2x 4 GB DDR3 RAM modules. The additional subwoofer upgrades the device’s already above-average speakers even more. The power supply delivers 120 Watts and clearly dwarfs a 90 Watt Lenovo power supply. The N76 supplies separate audio in and out jacks and supports S/PDIF. The brushed display lid is nicely designed and perhaps one of the reasons that the N76 was given the Red Dot Design Award 2012. A large fan balances noise and thermal build-up. In contrast to the prior N75SF, the case impression has improved greatly. The new case uses a lot of aluminum and pleasantly improves the wrist surface around the keyboard. The very good matte Full HD screen features a good contrast and viewing angles. Unobtrusive design elements loosen up the exterior without overdoing it. The interfaces are up-to-date and cover the usual range in the multimedia / home user sector. ...the frequently used interfaces are placed toward the far front and connected cables can become tangled. The network jack has a drop-down cover. The space between Gigabit LAN and HDMI output might be too small when large HDMI cables or adapters are used. The now-standard webcam and microphone enable video and voice telephony and chats. The round dotted pattern is one of the chic, yet unobtrusive design elements of the Asus N76 series. The Asus N76 is especially appealing due to its design, very good screen, above-average sound system, and equipment appropriate for the target group. A factory default configuration including an SSD, a better touchpad, and an optional higher capacity battery for mobile users. A more powerful graphics card is available in the N76VZ. 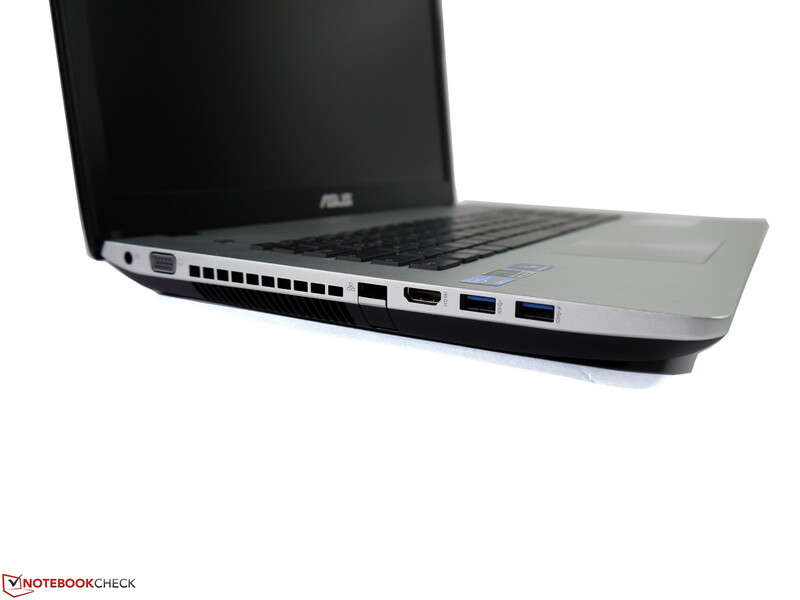 Asus made adjustments in the right places and created a great multimedia notebook. We can say, "Good bye!" to the glossy screen and cheap surfaces of the previous generation and, "Hello!" to a restrained, high-end device. 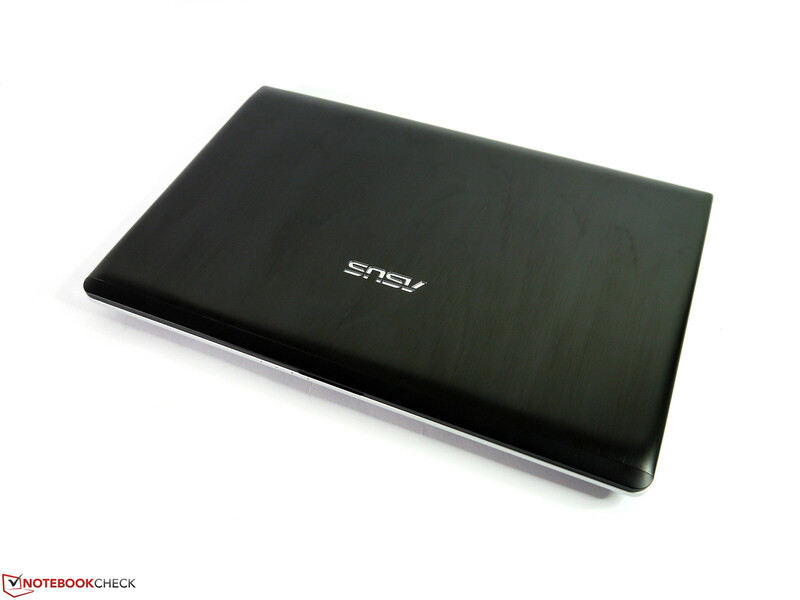 The Asus N76VZ, Samsung’s Chronos 700Z7, or Asus N56.